It was suffocatingly still…….and silent. We started walking up a wide road, lined with what looked like crumbling little cottages. The asphalt seemed out of place, the heat bouncing off it in waves and enveloping us in a disquieting haze. Peering into a doorway, spooked by my own shadow, it was evident these structures were never meant for the living. We had expected to walk through the city of Hierapolis, but it turned out our guide had decided to do it in reverse, through the Northern necropolis, set out like a miniature city with over 1200 tombs in every shape and size – tumuli, sarcophagi and house-shaped – from the Hellenistic, Roman and early Christian periods! And this is just one of three cemeteries surrounding the city! Hierapolis meaning ‘Sacred City’ was founded in the 2nd century and started out as a thermal Spa, due to its proximity to the Pammukale hot springs. 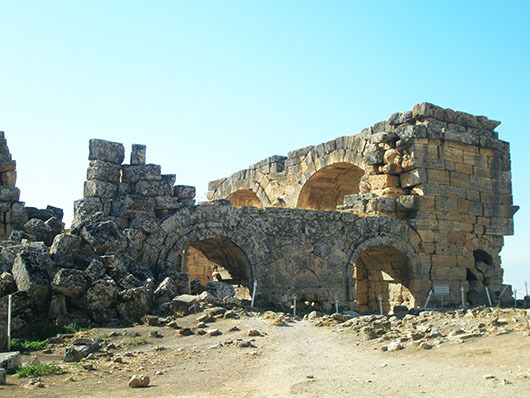 Thought to be named after a Phrygian temple dedicated to Hieron and/or Hiera the wife of the founder of the Attalid dynasty, Hierapolis became a healing center, and by the 3rd century was elevated to one of the most prominent cities in the Roman empire, with a population of over 100,000. 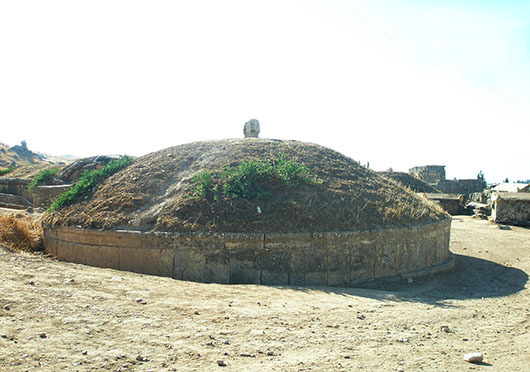 Judging from the number of tombs in the necropolis, I suspect the healing powers of the thermal springs is subject to debate. The ‘antique’ pool where Cleopatra is thought to have bathed, is now a tacky swimming pool inside a local hotel, so awfully overrun with people, we didn’t even venture close. Devastated by frequent invasions and earth quakes, and rebuilt several times over the centuries, the city was eventually abandoned in the 14th century. and buried in limestone deposits from the hot springs, until excavations began in 1887. 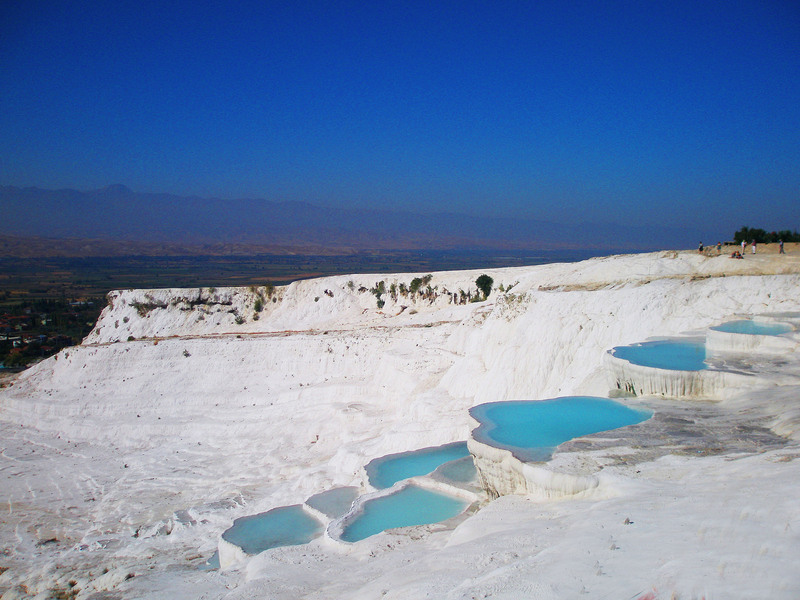 The dazzling white travertine terraces next door in ‘Pammukale’ or ‘cotton castles’ are formed by deposits of carbonate minerals from the hot springs. The deep turquoise thermal pools are nothing short of breathtaking. 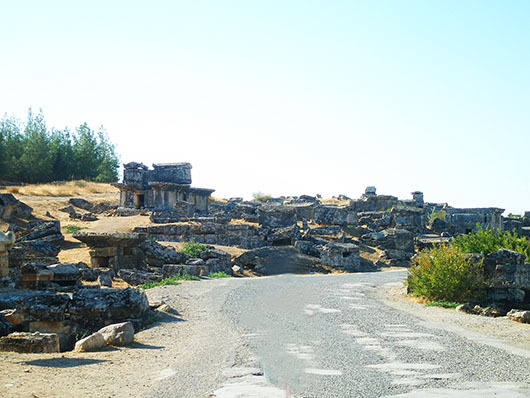 Hieropolis/Pammukale is usually combined with Ephesus and Pergamom. 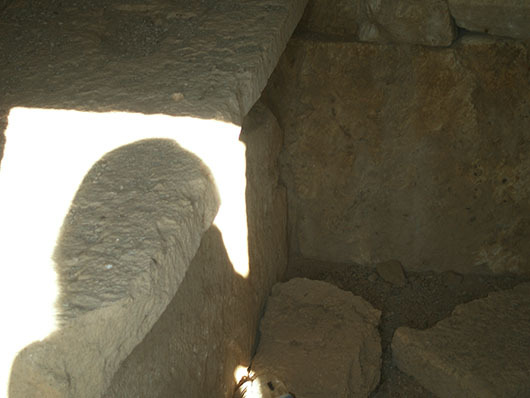 While her ruins are admittedly not as magnificent as those of her sister cities, the necropolis is the largest in Anatolia and possibly all of the Mediterranean. And considerably less frequented than the hot springs. Your description and photos are brilliant… Great post, Madhu! I don’t shy away from cemeteries…they tell us much about the living. Handsome photos and description, Madhu. Absolutely! Although there is a feeling of poignancy when I visit newer ones. Thanks Lynne. Walking through the cemetery makes me a little melancholy, thinking about all the unused potential and unmet dreams.. It’s kind of humbling too.. in that it reminds you that you’re very much still alive. Beautiful pictures as always! Fabulous! Thanks for sharing this visit with us! Another neat post, Madhu! 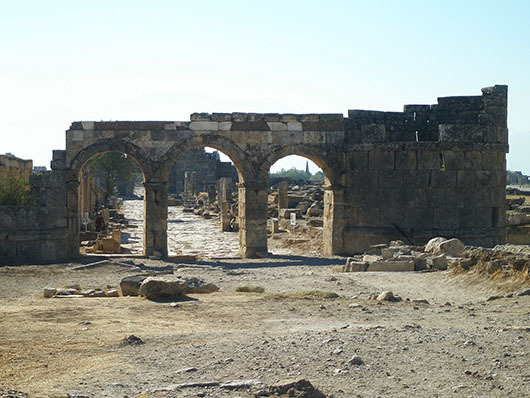 For a town meant to be a healing center, Hierapolis looks far from energizing or relaxing. However, it is a kind of place I normally would love to visit when I travel. Thanks Bama. I agree, and those tombs speak for themselves 😀 Perhaps people left it too late to come here to be healed? The architecture is what draws me in here. Beautiful stone and shapes. Great post. Lovely description with so much history and a touch of the tongue-in-cheek! 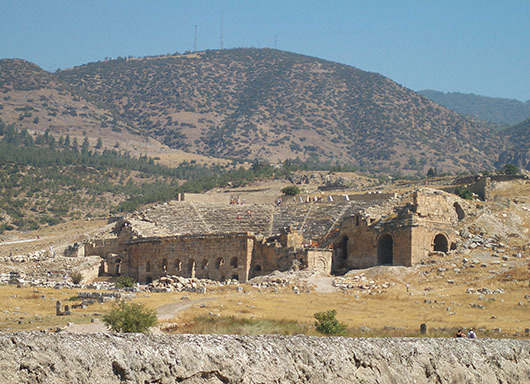 I had no idea Hierapolis was such a major city during Roman times – how ironic that the very hot springs that prompted the city’s foundation eventually buried it in limestone deposits! Glad you enjoyed it James 🙂 Turkey is a treasure trove of Greco/Roman sites. We barely scratched the surface. And the pic of your shadow….Well, you had set the tone, so I too was startled!!! Thank you so much for these Trips!!!!!!!! Very interesting. Your photos are always so brilliant, but the clarity of your narratives are also a pleasure. Appreciate the kind words Stephen 🙂 Thank you so much. Thanks for sharing, Madhu. I know I can always count on learning and seeing something new in your posts. The color in the hot springs is so striking! Yes, and the contrast with the white is dazzling! Thank you Naomi. This is awesome Madhu!!! Your pics and your voice really capture the feel for this amazing place. As someone who has always loved archeology, this essay hit me right where I live. You’re lucky to have been able to walk amongst history! Cheers! Thank you so much Stephen. You will love Turkey if you are a fan of archaeology! thank you for your HIERAPOLIS documents! Cool trip, one question – Are there any bones left in the tombs? What a fascinating place to visit, Madhu. What a great pity about Cleopatra’s pool, but I suppose they don’t really know for sure that she actually bathed there. I also like to explore cemeteries, but this one is outstanding. I don’t think they know for sure AD. And yes this was very different from the other comparatively modern cemeteries I have visited as well. As if I went back in time. Beautiful, timeless Necropolis. The images and words made a one sacred , unforgettable journey. Thanks. Beautifully written narrative and great images as always. Perfectly timed for our trip here next month – thank you! We’ve gone for one of your recommendations for Cappadocia so thank you and, yes, I’ll be telling you all about it – can’t wait! The hot springs look amazing. What a wonderful place to explore, Madhu! Thanks for sharing the post. So beautiful – it must be such an amazing place to visit. Thank you Madhu! coming back after a long time…. The Freshness in your photography is still as good…. Are you posting this as you travel? or are you posting the photos which were taken long back? Thank you. These are from a few years ago. I even do not know what to say, but Your post stopped me. Thank You for Your photo report and text. Glad you enjoyed it Sartenada. Thank you for the visit and comment! Thank you Ashok. Thought some of your projects were pretty awesome too 🙂 having to fill in my details each time I want to comment is a bit tedious though. 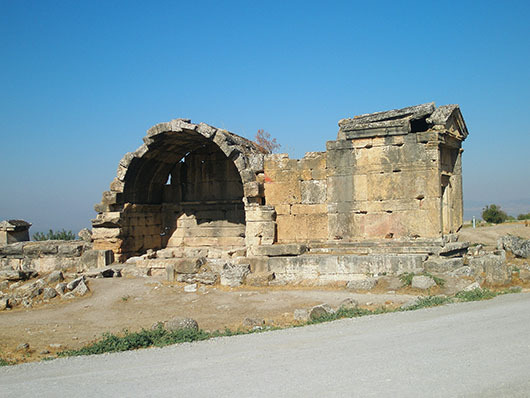 Wonderful Madhu, I was feeling sick in Hierapolis so didn’t take photos! Thanks Gilly. I don’t have any photos from Troy because my camera died down and I left my spare batteries in the vehicle! 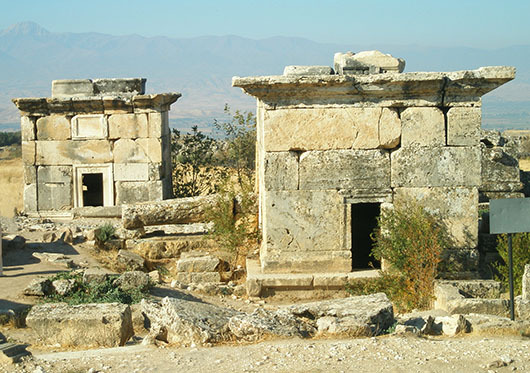 Your photos and story of the necropolis and “the dazzling white travertine terraces next door in ‘Pammukale,’ are a contrast in moods. Dazzling white and turquoise in one. Somber, historic notes in the other. Each with a rich history. Oh Eliz, thank you so much! How very interesting! You have such a knack for writing and storytelling. Oh Fergie, that is so lovely to hear from someone who writes as well as you 🙂 I admire your Haikus so much! Thank YOU for finding the time to visit Eric. Hope the editing is going well. Those thermal pools are stunning! Like a little mirage!